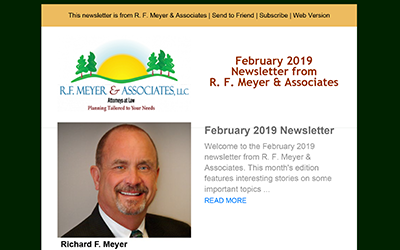 Today we released our February 2019 newsletter from R. F. Meyer & Associates. This is the last year for a Social Security strategy that’s been popular in recent years, where couples time the claim of spousal benefits. Regulators have deemed the strategy a ‘loophole,’ and its availability is going away. 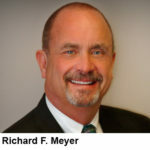 The Home Care benefit of Medicaid now is available in 50 states – recognizing the facts that home care is both preferable for most people, and cheaper for Medicaid than long-trm car in a nursing home. Costs are really all over the board for long-term care insurance, according to a new study. If you are in the market for this insurance, it really pays to shop around. A loved one who is suffering from dementia and is a gun owner poses special challenges. Read about how experts say the situation should be handled. I’m sharing this intro to the newsletter in this blog post for those of you who don’t subscribe to the newsletter. You can click on the link below to view the whole February 2019 edition in PDF form. You also could subscribe to receive the monthly newsletter by filling out the form at the bottom of our blog page at this link. However we’re getting the copy to you, we hope you find this month’s articles informative. Please let us know what you think by dropping an email to Info@ElderLaw.US or visiting us on Facebook or Twitter. For full newsletter in PDF form, click here.